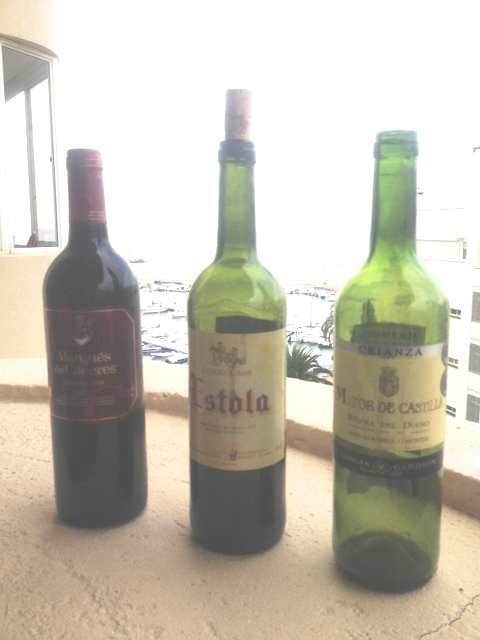 A few comments about the good and very inexpensive wines to be found here on the Costa del Sol. We have not spent more than 6.5 Euros, retail, for any bottle, red or white. They are widely available in any retail food shop or market. The best selections are in the Carrefour supermercado. Most reds, usually riojas, are 2010 vintage or older. We just enjoyed a bottle of Estola 2008 Riserva, which is a blend of tempranillo and cabernet sauvignon, that was quite drinkable. It was one of the more expensive purchases at 4.50 Euro. Another recent quaff was a Mayor del Castillo 2010. Very pleasant, especially at 3.50 Euro. Our most expensive purchase to date, though we haven’t consumed it yet, is a Marques de Caceres Crianza 2009 at 6.50 Euro. If these prices were available at home, we would most certainly be drinking Spanish wines exclusively. The region is not known for outstanding blancos but a Marques de Caceres 2011 was lovely at 4.95 Euro and a Casa Mayor 2012 Rijoa slid down nicely. The Tinto de casa in most restaurants and tapas bars is very easy to drink and most of us would be proud to serve it to guests. Winery tours in Jerez this week taught me that there’s always something to learn. More to follow. Since Anita is writing all of the posts, I wanted to at least write something I’m familiar with. This entry was posted in Uncategorized on September 17, 2013 by ayoelkers. I love Vino Verde. We had a wonderful bottle in Seisimbre, sitting by the water and enjoying the late afternoon sun. I love Portugal. We were in Collares (our friends own a home there), just a hop skip and jump from Sintra. Great food, great wine, great coffee and of couse, sardines. Enjoy every minute you two.